St. James Infirmary, of Ashington, Northumberland, was formed in 1985 as the vehicle for singer, songwriter and multi-instrumentalist g.w.lang and has been continuously active ever since. g.w.l. is assisted in his work by an evolving and rotating cast of bandmates, and at last count, SJI has had something in the region of 40 members. The SJI catalogue spans literally dozens of recordings on cassette, vinyl, CDr, and Digital Download. With hundreds of catchy songs and multiple band members to draw from, no two appearances are the same, and may incorporate elements of prison work songs, motorik grooves, no-wave grind, music-hall sing-along, boom-box drones, murder balladry, comedy, iPad apps, wigged out psychedelic guitar solos, feedback-drenched improvisation, musique concrete, audience-baiting repetitiveness, or whatever they’ve found in the classic rock toybox that week. Quite often, songs will be written on the spot, or changed on the spot, or lengthened, or shortened. Sometimes the band will be playing a song that they have literally never heard before. 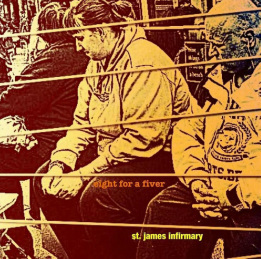 St. James Infirmary: for when first on the bill matters. PUNKY fun rock takes centre stage in Eight For A Fiver which plods along happily and shows that St James Infirmary aren't ones to take themselves too seriously. The track examines the availability of eight cans of lager for pounds 5 and the impact it has on the community and that pretty much sums up what you can expect lyrically.But instrumentally the group, which is the brainchild of singer-songwriter GW Lang, knock out powerful and precise beats that culminate in a catchy tune that would easily get a moshpit worked up. Now if you’ve ever been to Pegswood then you might understand what G.W. Lang (Gary to his friends) is on about. This is a lyric from a long forgotten tune that St James Infirmary released on tape back in 87 or 88. Yes folks this is no new band of whippersnappers. Gary and the gang have been putting out material for 27 years. And this, “Eight for a Fiver” is their latest release. A catchy ditty about how many cans you can get for £5 in Ashington, I presume. Its reminiscent of the stomping bashfullness of Half Man, Half Biscuit. Gary is like a Mark E Smith character keeping his band going year after year. Although I doubt he has been through as many band members or wives as Mark!!! 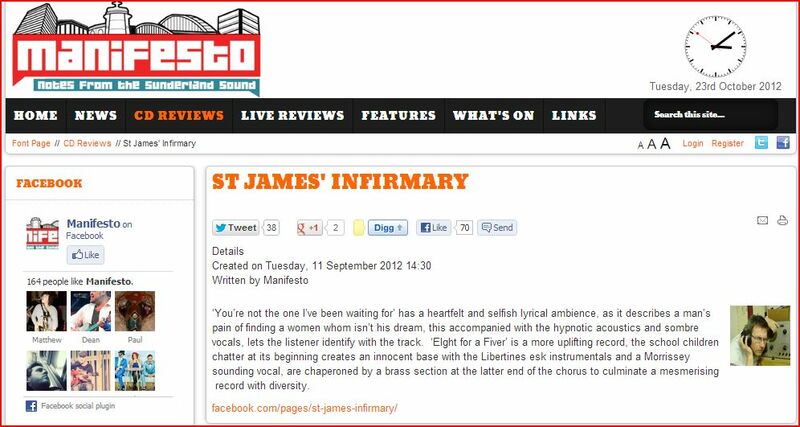 You may remember we featured St James Infirmary a while back. They release CDs on a regular basis and give them away to fans. This “Almanac” is a treasure trove of goodies. Get in touch and they’ll send you some. Because of their kind spirit I had no doubts about sending off my money for this their first official release in years. A two track single released on the “Dibble Records” label. As well as the mightily catchy “Eight for a Fiver” (check out the video below for proof and you’ll be singing the tune in your head all day!!) It also features “Thank-you, I’m sorry, but you’re not the one I’ve been waiting for”. Which sounds like a title Dave Gedge would come up with but is in fact a folky lullaby which reminded me of “Easy Pieces” period Lloyd Cole & the Commotions!!! Anyway check this lot out.